There’s a reason we love to visit the wine country: The closer you are to the source of what’s swirling in your glass, it seems, the more you appreciate that cabernet or chardonnay. But if driving from tasting room to tasting room isn’t quite your style, consider sampling wine Chilean-style, perhaps with lunch in a hundred-year-old estancia or in a sunny garden with cheese made onsite. Even better, Chile’s long, thin profile means that you can go from wine tasting to sitting on the beach, scaling the Andes, or exploring colonial-era cities in a single day. Chile’s wine country stretches for hundreds of miles, but producers in the central part of the country are less remote and offer easy access to Santiago’s modern airport and Valparaiso’s hill-strewn landscape. Steeped in the kind of gritty chic that arrives with the leading edge of a comeback, this seaport city is now filled with brightly painted frescos on nearly every surface, funky galleries and shops and tiny food-centric restaurants. Quirky funiculars ferry passengers up and down the urban Matterhorns that divide the city into San Francisco-like neighborhoods studded with mansions built by 19th-century industrialists. Occupying a privileged perch atop Cerro Alegre, Casa Higueras is one such mansion. Spilling down a steep hillside overlooking the bay, the 20-room inn is embellished with woodwork so glossy it glows, oriental rugs, a stunning outdoor restaurant and a series of tiered gardens that end at a serene pool and spa. Rooms, accessed through massive carved-mahogany doors, are set with marble baths, four-poster beds and an open-air terrace (rates start at $215 per night). From Valparaiso, Chile’s Casablanca Valley, which is known for crisp white wines, is just a 30 minute drive away. At Indomita, tour the wine-making operation and compare the company’s offerings in the tasting room; a better bet is lunch overlooking row upon row of chardonnay and sauvignon blanc vines at the winery’s elegant restaurant, where you’ll discover innovative takes on Chilean favorites like Patagonian lamb, sea urchin, and fish like corvina and mero, all perfectly paired with the whites being grown right outside the restaurant and reds from Maipo Valley. Just across the street at Emiliana Vineyards, alpacas greet visitors as they approach, guinea hens scatter, and a peacock struts across its domain. Organic and biodynamic, Emiliana relies on nature to keep pests and weeds under control. After strolling through a landscape so lush that it resembles an English cottage garden, step into the cool, windowed hacienda for wines paired with chocolate or local cheese and honey. The honey, along with a few other products, is produced by a team of staff members who man the hives in return for a percentage of the sales. 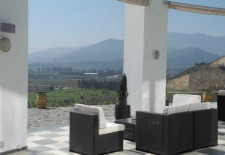 Tucked into the nearby Rosario Valley, Matetic Vineyards’ organic pinot noir, syrah, and sauvignon blanc grapes share the winery’s 27,000 acres with horse tracks, hiking and biking trails, a restaurant and – in a restored 19th-century casona – a seven-room inn. Led by a huaso, or Chilean cowboy, horseback riding tours meander through vineyards, over hills, and across meadows hemmed by forests. Hikers and bikers can grab a bottle of wine and picnic basket and uncover their own secret sanctuary. The inn’s individually decorated rooms feature lovely throws loomed from local wool, flat-screen televisions, patios and colorful tile bathrooms (from $500, including breakfast and dinner). Just steps away, there’s a palm-shaded pool, where you can sip wine and nibble sharp house-made sheep-milk cheese and, in the evenings, listen to live music as you plan the next day’s wine exploration.